Last weekend I did a bit of running! A post to follow on that no doubt but first I thought I would update you all briefly on the riding. Well, I didn’t ride at the weekend. I have made a decision to stop riding at one of the stables I was at – I didn’t take the decision lightly, some might say I thought about it too much. At the end of my last lesson there I was told off for briefly becoming frustrated and giving up, I pulled myself together and got back into the lesson with little to no help from the instructor but when I admitted that I had given up I was told that I shouldn’t give up, in life as well as a lesson and that I shouldn’t be a quitter. I felt really down after that lesson, I kind of beat myself up about it a bit – until my friends pointed out that I am meant to enjoy riding. That particular stables is not for me, it is too business-like (I know all are businesses but you know what I mean 🙂 ) and they do not seem interested in my experiences as a rider, people seem to come to pay their money and ride, there is little interaction with the horses or people and there is no hacking which I have come to realise I adore. 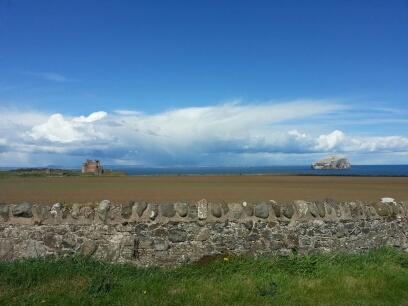 So…I quit, just like a great, big quitter would and do you know what when it came to the time I would normally have been heading out to that stables last weekend instead I was pumping up the tyres on my mountain bike ready for a little push out round to South Queensferry with a smile on my face. I haven’t quit, I made a positive decision – took me a while to see that. Don’t worry though I still have my two other stables and I am now thinking about trying a different one out too – why not? But in the meantime I had two great riding experiences last weekend that really helped cement my decision. On the hack in the morning Flame and I were out through the stubble fields, I panicked a bit as the only gear I usually have in stubble fields in ‘whooaaaaa!’ gear 🙂 With a few tips and focus I got the reluctant Flame to listen to me and we had a lovely hack, interrupted only by the hoardes of flies that descended upon us in the fields making us beat a hasty retreat to the beach. On the beach I did two canters with the owner of the stables, away from the ride and back then…my mate and I went for a canter ourselves – two in fact 🙂 I felt secure and even looked up at the view and across at my mate during these ones, previously I would only stare intently where I was going. High fives all round. Next up I did a canter in a field, bear with me here. I had mentioned to the owner that my nerves seemed to heighten when cantering outside in a group, so she put me to the test just a little by making me do these different canters. It was really reassuring to see I haven’t lost my ability to canter securely in forward seat or indeed to push on when I feel my horse backing off. 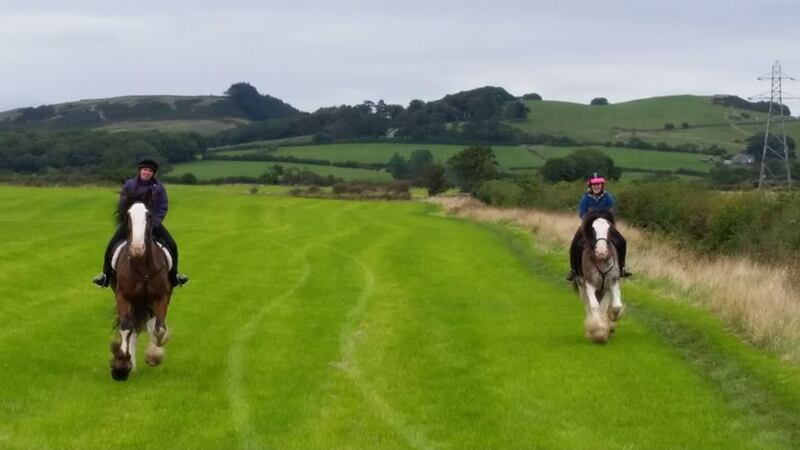 A successful hack, made all the better by the lunch we had afterwards at a nearby cafe where horses and riders pitched up for a break – both myself and my mate are now keen to work out where we can do that! A couple of hours later and I was sorting out my stirrups on Td for a lesson. Now I have mentioned before Td and his incredible belief that everything, and he means everything is better if you do it at canter! Well I haven’t experienced that a lot recently, it has been more about getting him going and getting myself convinced we can canter without something going wrong. A week past Sunday and we were flying around, and it didn’t phase me! He kept breaking into canter so I simply checked him and headed into the poles again then asked him to canter on the otherside. We had one hellish canter where he was slightly unbalanced and I should have pulled up but didn’t, that one was on me so he got an extra pat for trying damn hard there – next time I will pull up because I don’t believe that was fair on him. What was nice was that my classmates actually commented on how happy and confident I looked with him, our instructor noticed too – she actually laughed as she realised I had checked Td back to trot before she told me to and that I was relaxed about it. The only thing that made me sad about the whole lesson was that she mentioned giving me a different horse in lessons now that my confidence is improving – I get that but I will miss Td so much. Not that he will miss me, he is world’s most indifferent horse – it is quite funny to watch actually. My nerves are part of my riding but they aren’t all that my riding is about, I will continue to push myself but those two experiences were lovely ones to have following a lesson where I was told I give up too easily. Sometimes it is good to trust yourself a bit more than others who say they know what is best for you. Apologies for the lack of a post in the last couple of weeks, somehow time has run away with me. Well this is going to be a full-on horse-y post. The last couple of weeks have been a bit of a break through for me so there will be a couple of posts on this aspect. 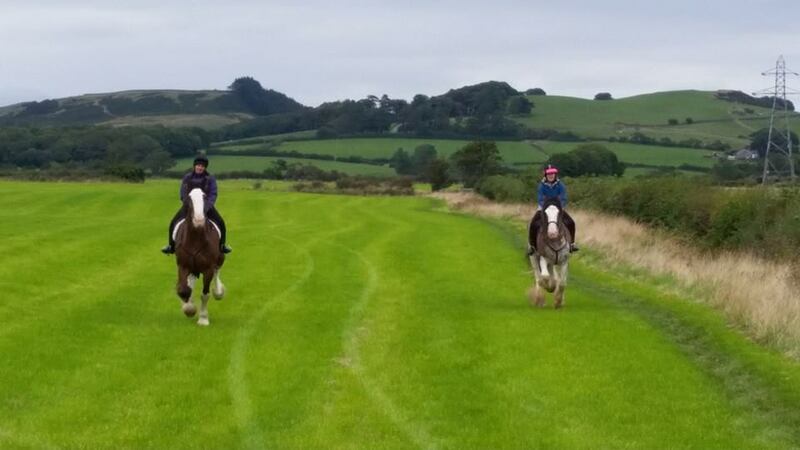 Firstly, I thought that I should provide evidence that the nerves regarding outdoor canters are receding – here are a few pictures of Ellie and I at Cumbrian Heavy Horses charging up the field! I had such a great time there in August. 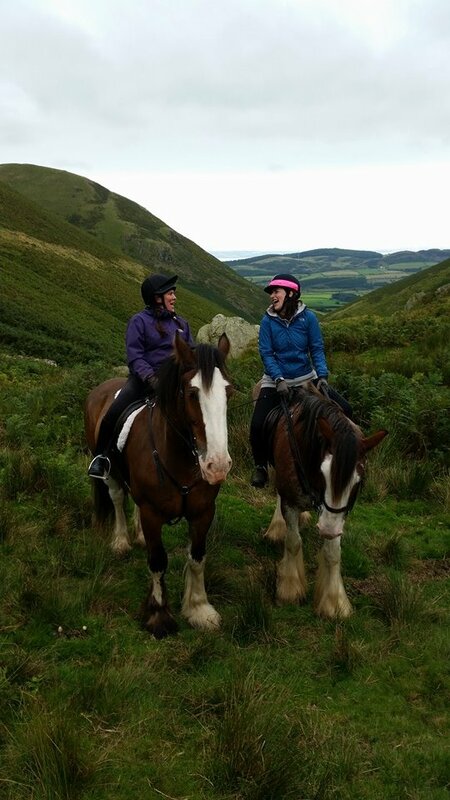 I chose a fell ride with Leanne who I had met while riding with CHH in June, due to my vertigo we had chosen a low fell ride to see how we got on with an idea to maybe doing a full on over the top of the hills ride sometime soon. As usual when I arrived the staff were lovely and the other riders were great fun, chatty and friendly. Toby took us out on this ride and he was helpful and did push me to try things that I would have (and did back in June) shy away from. This time I took the bull by the horns and in the individual exercises I didn’t wait to go last but instead asked to go second so that I didn’t build things up in my head. 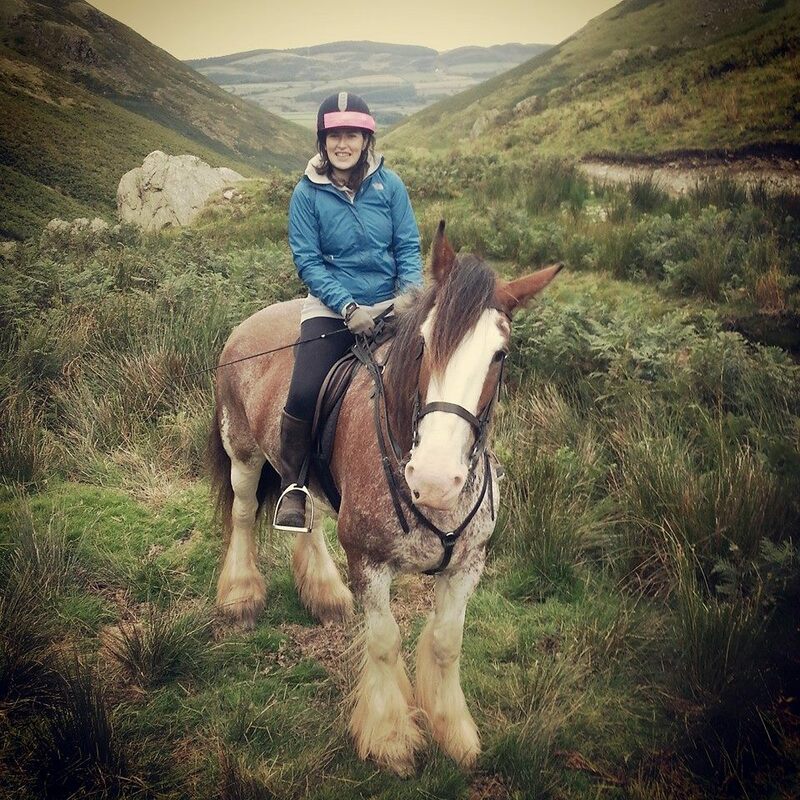 The first time riding away from the group my nerves rose and I kept feeling Ellie trying to turn and head back, I felt myself tense up and we had an appalling walk away and an okay trot back with me feeling unbalanced and frustrated. Toby pointed out to me that the moment Ellie tried to turn I seemed to shrink, that my shoulders rounded forward and I lost all my position – I also did use the whip at all to re-inforce my aids. With these comments in my ears on the next go I felt myself begin to curl up when Ellie tried to turn, by noticing it I was able to check it and then ask her to move on more firmly. 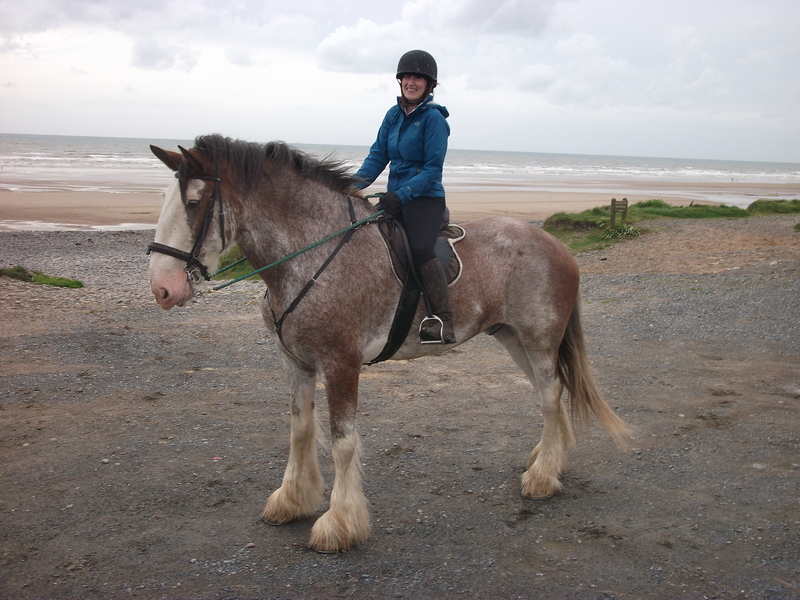 I got a much nicer line, a beautiful turn and halt then a fast but not rushed canter back – much better. After a second practice canter for us all we headed into the next field for a group trot and then another optional canter. The way CHH run it is that they often halt the horses then get people to head off in one direction then canter back. In this particular field we had the option of doing the whole on one side of the field either by ourselves or together. A bit worried about Ellie racing I decided to go alone and only canter back on half the field, then Leanne asked if I would go with her and Jake (who was forward going) and do you know what, I said yes. Because actually I have raced these horses before and that was fun! Off we went and pretty much did the whole field, my nerves were raised before we turned but the moment I was able to easily halt Ellie I realised she was happily listening so decided to push her. It was great fun! You can unfortunately clearly see that Leanne and Jake re soundly beat us BUT this was a big step for me so I am pretty happy. After that we wound our way up to the view point with lots of chatting and me giggling at Ellie – honestly she put her head down to drink at the stream so quickly I lost half my reins (she has double reins), the embarrassment especially as I had already dropped my whip earlier on the ride. Nobody wants to have get off and on again with a Clydesdale! I really like this picture, it shows how happy and relaxed I was for most of this ride. We had some lovely pictures around halfway up the fell and all marvelled as our leader Toby pointed out the small trails criss-crossing Black Combe which they use when the horses go over the fells properly (for another day I believe). On the way back down there was an opportunity for another canter but I declined, while I do regret it I had had such brilliant fun that I was worried I would ruin it all by being daft. The others all had a go, individually or in pairs and it was a real treat to watch these horses come flying up the hill towards me. It definitely won’t be a year until my next visit. It took a special horse to get me smiling in canter again and Ellie is definitely that! The last couple of weeks riding up here has been interesting, one lesson that has resulted in me knowing what I definitely don’t want but more riding that has reminded me why I do this.